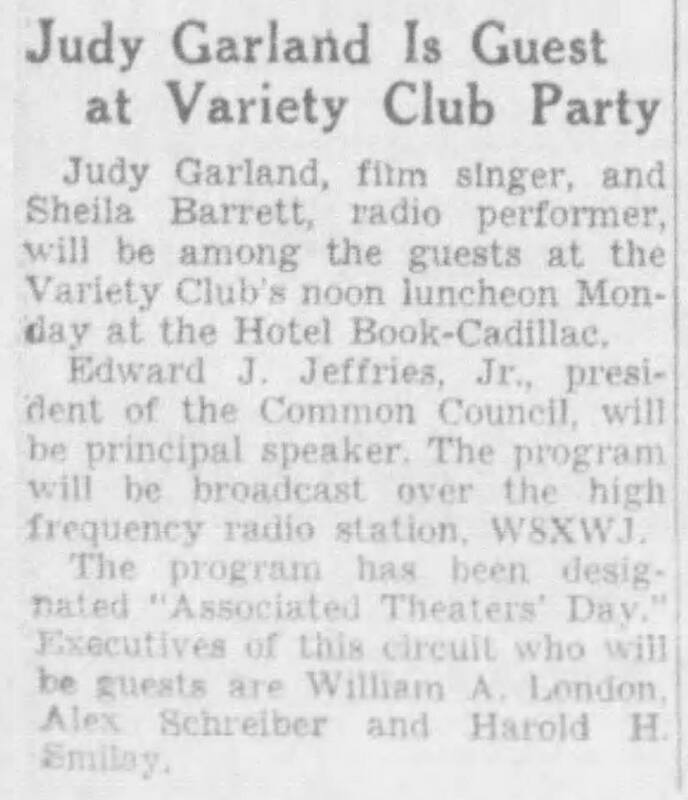 March 20, 1938: More from Judy’s Everybody Sing tour. She was currently in Detroit, Michigan. This notice mentions a planned luncheon that Judy was scheduled for the following day. They sure kept her busy! The caption for the photo mentions Judy’s live appearance at the theater showing Everybody Sing. 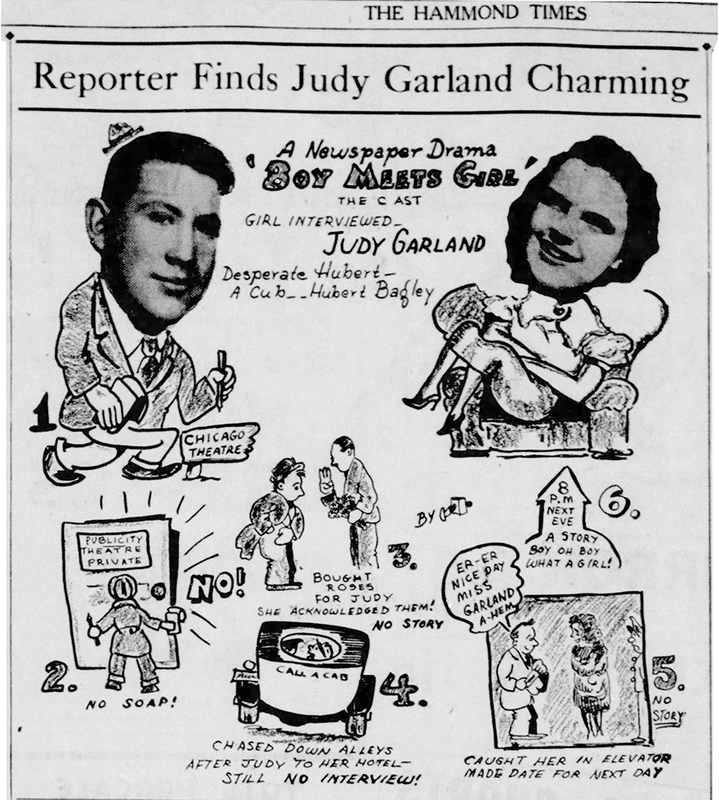 March 20, 1938: “Reporter Finds Judy Garland Charming” – this fun cartoon and article appeared in the Times newspaper out of Hammond, Indiana. 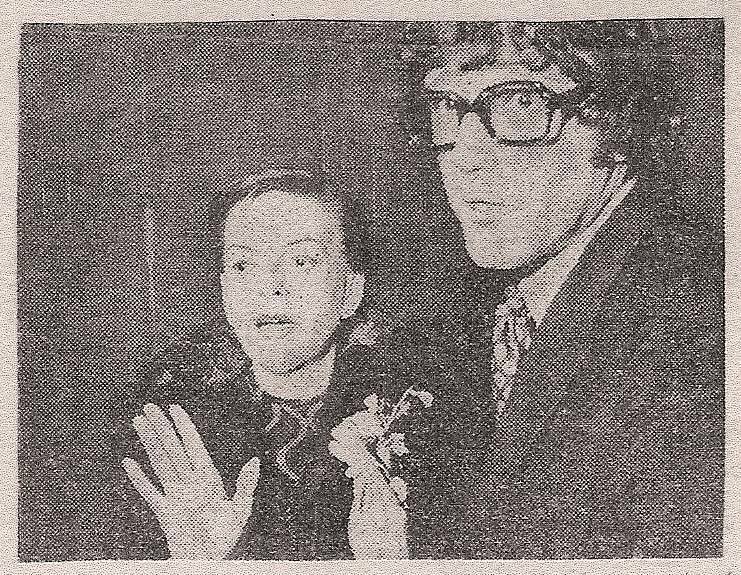 A local high school boy named Hubert Bagley traveled to Chicago to meet Judy during her appearance there. Judy Garland, a peppy, Titian-haired girl of 15, dashed into the wings and started up the stairway leading to a dressing room at the Chicago theater. ‘C’mon upstairs where we can talk – there’s too much noise here,” she invited, and led the way into a modernistic dressing room where she – just relaxed. “Oh, I really didn’t want to be an actress, I wanted to study lawny, but my parents are show people and well, here I am – and I’m having a good time,” she exclaimed, and dropped herself into a comfortable chair with no more ceremony than any other healthy school girl of 15. Judy has been on the stage for 10 years now. The Garland family, who played at the Chicago World’s fair, has trooped all over the United States. About two years ago, she went to Hollywood, sang for the Metro-Goldwyn-Mayer officials, and captured a long-term contract. “If you want to get into movies, work, work some more, cross your fingers, and just hope – but don’t go to Hollywood; it’s easier to attract the attention of a talent scout near your own home.” She toyed with a couple of stray curls on the nape of her neck. When words fail – and the carefully prepared list of questions seems glued to the trouser pocket – and one of the nicest girls in the world has talked herself out, there’s nothing to do but leave. 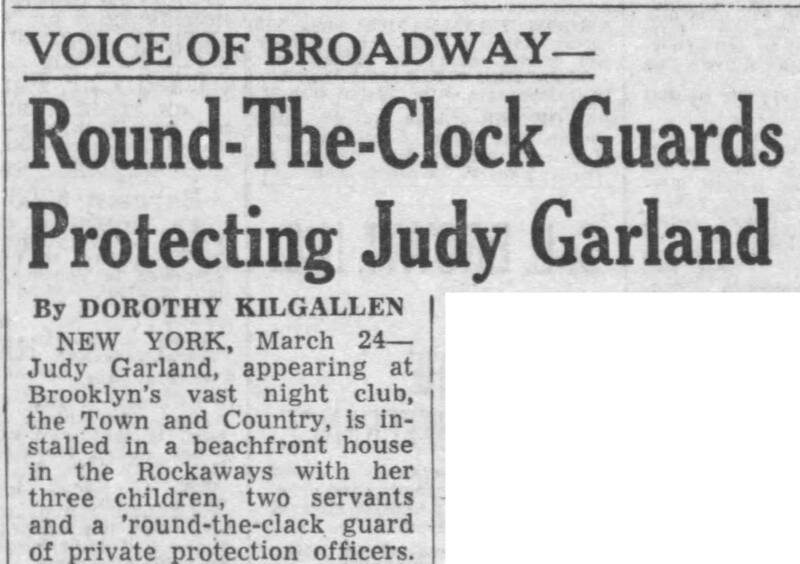 March 20, 1938: Here’s an article about a local production of “The Wizard of Oz” that mentions MGM’s upcoming production starring Judy and that “it will mark Miss Garland’s greatest achievement to date on the screen.” How right they were! 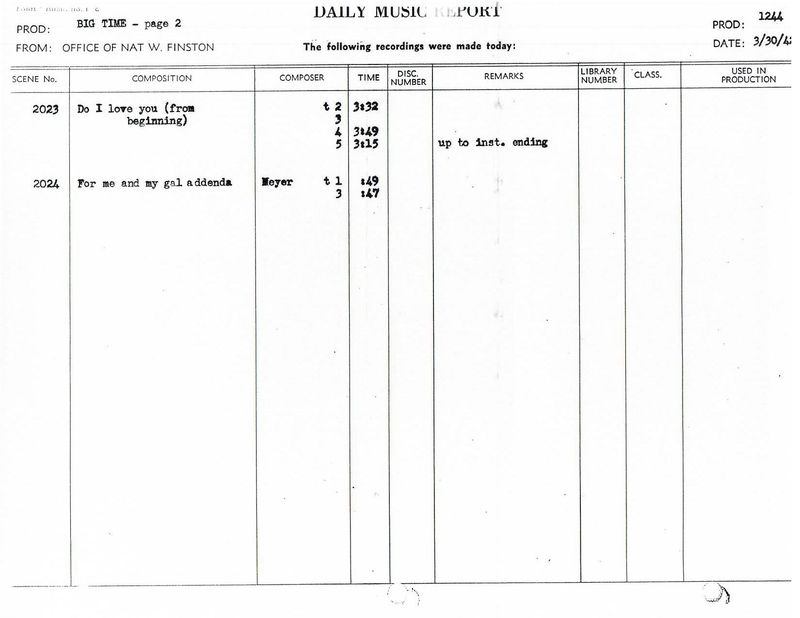 March 20, 1942: Judy had a recording session for For Me And My Gal. 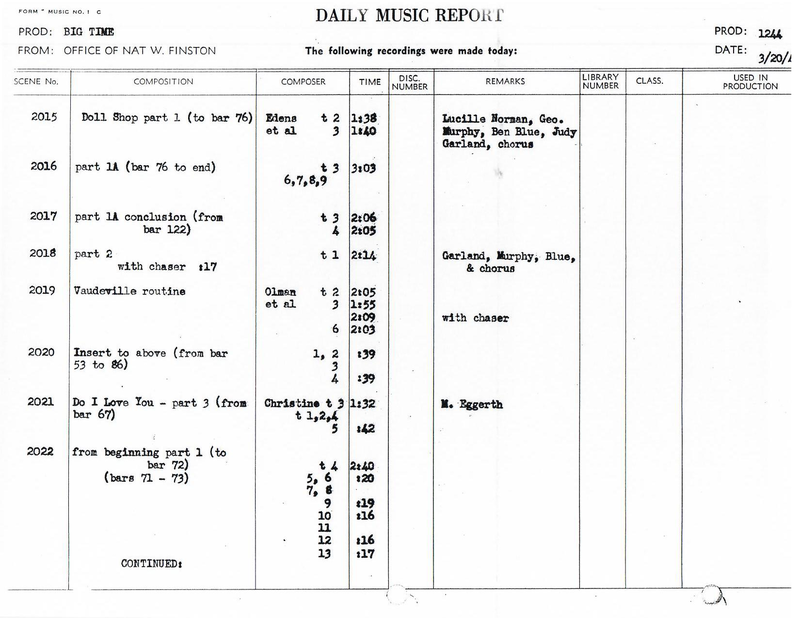 At this point, the film was still titled The Big Time, as reflected on this Daily Music Report for this day. Judy, along with Lucille Norman, George Murphy, Ben Blue, and the MGM Studio Chorus, pre-recorded the extensive “Doll Shop” sequence. 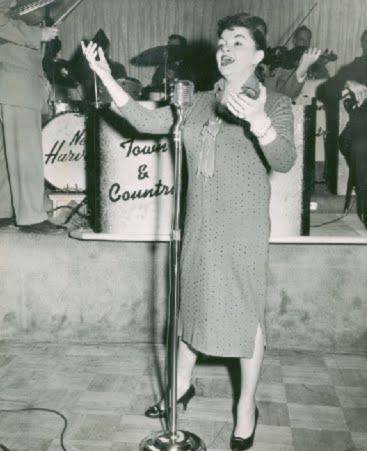 Also pre-recorded on this day, part of Marta Eggerth’s solo of “Do I Love You?” Time called: 1:00 p.m.; dismissed: 5:00 p.m.
March 20, 1945: The Harvey Girls filming consisted of scenes on the “Interior Harvey House Party” set. Specifically, the “Round and Round” number. 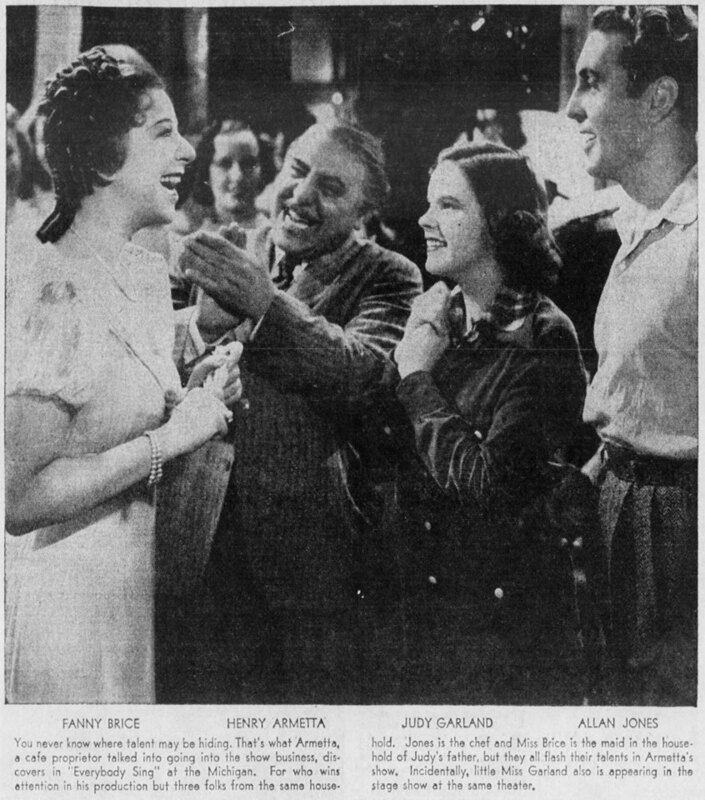 The assistant director’s notes state: 11:48-12:20 Rehearse w/JG although she said we could not shoot with her as her hair was done wrong and would have to be done over – it was decided to call lunch; 1:20-1:49 – Rehearse w/Harvey Girls and stand-in while waiting for JG who was dissatisfied with her hair arrangement, which was done by other than her own hairdresser who is ill – Judy’s hair had to be done all over; 1:49-2:55 – Waiting for JG; she returned to the stage at 2:47; ready at 2:55. Company dismissed at 6:40 p.m.
March 20, 1950: Here are two notices about Judy currently “vacationing from the movies” and on the advice of doctors, needing a “checkup” in Boston, Massachusetts. Judy had completed her work on Summer Stock, including the filming of the iconic “Get Happy,” by this point and was taking time off to rest. 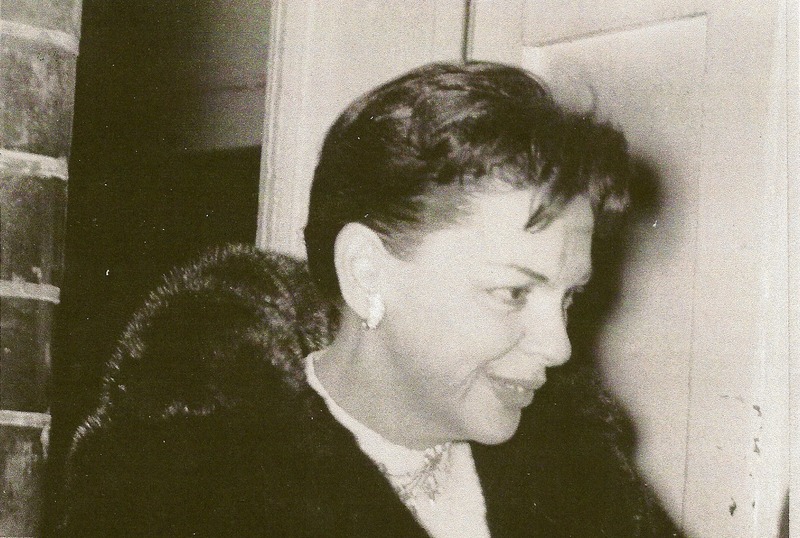 She, husband Vincente Minnelli, and daughter Liza Minnelli, never made the planned April 1st trip to Paris as mentioned here nor did Judy go to Boston, she rested in Carmel, California, intending to take a full six months off, but she didn’t make it to three weeks before she was called back to MGM to replace a pregnant June Allyson in Royal Wedding. 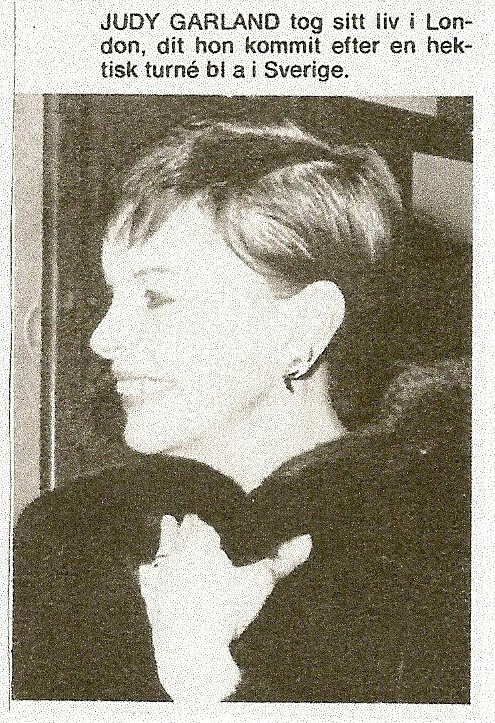 March 20, 1958: Judy opened a three-and-a-half week engagement at The Town and Country Club in Brooklyn, New York. The show as scheduled to start at 10:30 p.m. It started at 11 p.m. due to a delay caused by a twenty-four-hour snowstorm. 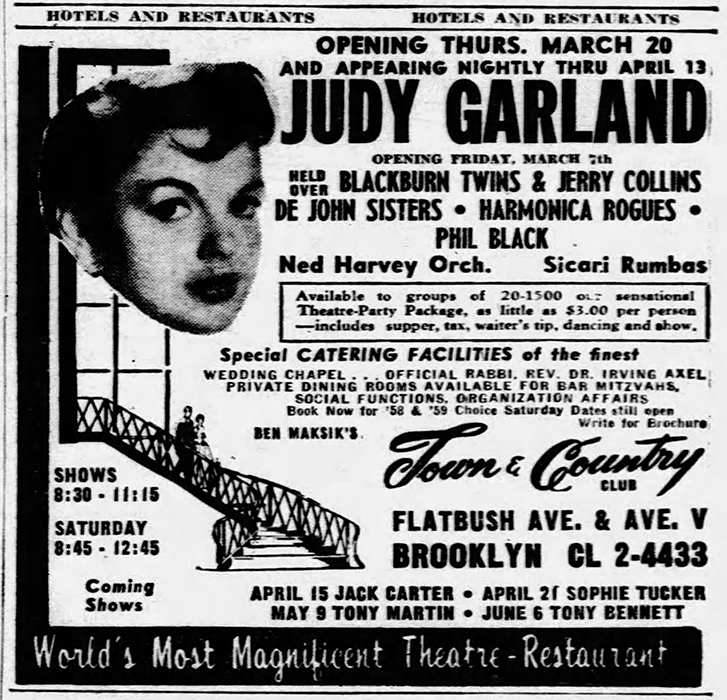 In spite of the snowstorm, Judy filled the venue to capacity (1,700 east). Her salary was $25k per week, with an advance of $15k in cash when the contract was signed on October 4, 1957. March 20, 1964: Judy left the Cedars of Lebanon Hospital in Los Angeles, California, and flew to San Francisco, California, for several days of rest, accompanied by her musical advisor, Robert Cole. Judy had been admitted to the hospital on March 19 suffering from flu-related stomach pains that they thought might be appendicitis. 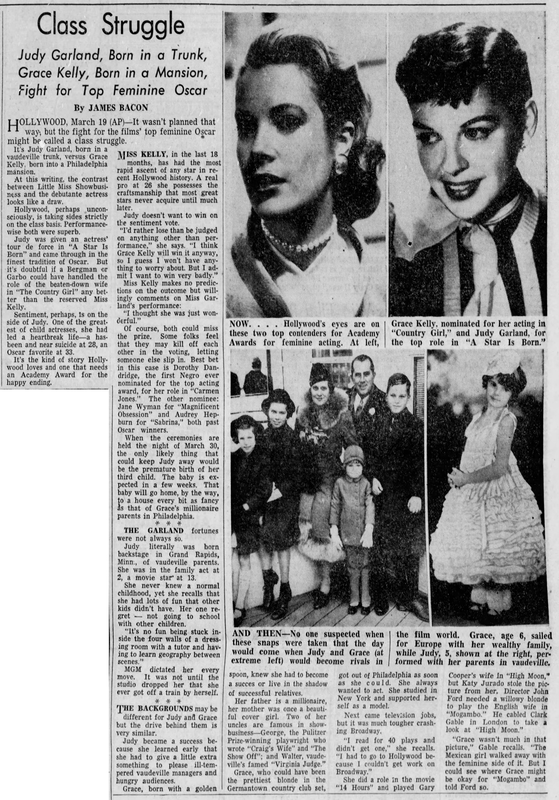 Judy stayed in San Francisco through March 25, which is when she attended the opening of a new musical titled “Firefly” that she was allegedly interested in purchasing. March 20, 1965: After finishing her show at the Fontainebleau Hotel in Miami, Florida, Judy rushed over tot he Eden Roc Hotel to substitute for Debbie Reynolds, who had collapsed and could not go on. March 20, 1969: These photos appeared in the local Stockholm, Sweden newspapers. Judy had just successfully opened her show in Stockholm the previous night. Photos from the collection of Kim Lundgreen. Thanks, Kim! March 20, 1977: We all love Margaret Hamilton. Here is a nice article about “Maggie” and her thoughts about Judy published the day of the annual airing of The Wizard of Oz in 1977. When Judy Garland began her cyclone trip “over the rainbow” and down the “yellow brick road” to stardom on the set of the new classic motion picture “The Wizard of Oz” she was a relatively unknown teenager. “But once we started to work with her, we realized there was something special about her,” recalls actress Margaret Hamilton, who starred as the Wicked Witch in the film, which will air Sunday, March 20, 7 to 9 p.m., on CBS-TV. As she sat near the fireplace in her town-home apartment overlooking Gramercy Park, in New York City, Miss Hamilton betrayed only by an occasional facial expression that she was once a Wicked Witch who lived in Oz in a dark castle complete with drawbridge, parapets and flying monkeys. Although Miss Hamilton was aware of the star quality in the young Judy, she had no idea, of course, that the film would become a classic, reaching landmark statue [sic] in motion-picture history. Nor did she envision its popularity lasting the better part of a half-century. “Now I can see why it became a classic, but then, when we were filming it, I didn’t even visualize its lasting 10 years,” she admits. March 20, 1977: “TV Guide” ad for the annual showing of The Wizard of Oz on CBS-TV. Scan provided by Kurt Raymond. Thanks, Kurt!